The band Grace, then without apostrophe, is founded in 1968 by Henk van der Burgh and his two brothers Frans and John, together with Ronald Dobber and Guido Collard. The band plays predominantly covers. In 1970, John and Frans van der Burgh leave the band, and they are replaced by Ed Kemperman and Peter de Wijn. Their debut single 'I hear music' is released in 1975, but it doesn't chart. Two further singles also flop. In 1979, singer Gerda van den Outenaar joins the band. It ultimately results in a change of the band name in 1983 to G'Race and a contract with a bigger record company. 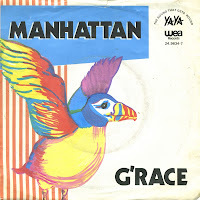 G'Race's first single 'Manhattan' is released and peaks at number 4 in the Dutch Top 40. It's the first of three hit singles, after which the band keeps trying for success without results.